Does your child ignore every consequence you give him? James Lehman can help with 10 specific ways to make consequences work—even for the most resistant child. That’s because receiving a consequence makes kids feel powerless. Their sense of self almost requires them to respond by shrugging and saying, “Whatever,” simply in order to feel in control again. Focus on what you want your child to learn from the consequence—not whether or not he’s going to care. Personally, I don’t think parents should worry too much when their child appears not to be affected. Instead, I think you should focus on what you want your child to learn from the consequence—not whether or not he’s going to care. In fact, I think trying to get your child to care is a misdirected goal. Don’t put so much weight on making him “hurt” that you’re not thinking about trying to get your child to learn a new behavior. If your child can stop you in your tracks by saying “I don’t care,” you’re giving him way too much power. To put it another way, if you’re looking for your child to surrender, forget about it. A consequence is not designed to make your child say, “I’m sorry, Mom, I was wrong.” Rather, it’s there to help your child change his behavior. Think of it this way. The consequence for not following the speed limit is that you might get a speeding ticket. You may shrug and say, “Whatever,” to the police officer when he pulls you over, but that won’t stop him from giving you that ticket. And if you say, “I don’t care,” he’ll say, “Well, here you go, sir. Have a good day.” He won’t argue with you. He’ll simply hand you the ticket and walk away. Then simply turn around and leave the room. And even if he says he doesn’t care, let him know that he will encounter them again if he breaks the rules. Here are 10 tips for how to give consequences that work—even when kids say they don’t care. It’s almost never effective to give your child a consequence in the heat of an argument. Often, parents will be either too harsh or too lenient, because nothing appropriate comes to mind immediately. I advise parents to sit down and write a “consequences list.” You can think of this as a menu of choices. When compiling this list, keep in mind that you want the consequence to be unpleasant, because you want your child to feel uncomfortable. It’s also important to think about the lesson you want him to learn—and this lesson should be attached to the consequence. If, like most teens, your child’s cell phone has meaning for him, don’t be shy about using it as leverage. So let’s say your child curses and is rude to his sister, and you want him to learn how to manage his feelings. I think an effective consequence might be that he would lose his cell phone until he doesn’t curse and isn’t rude to his sister for 24 hours. In those 24 hours, he might also have to write a note of apology to his sibling stating what he’ll do differently the next time he gets frustrated. If he fails to write the letter, he doesn’t get his phone back—and the 24 hours starts all over again. When you give a consequence, the simpler you keep things, the better. Again, you don’t want to get into details and long speeches. What you want to do is lay out your consequences for your child’s inappropriate behavior very clearly. And whenever you’re going to introduce an idea to your child that may be unsettling, anxiety-provoking, or frustrating to him, do it when things are going well, not when everybody’s screaming at each other. Wait until a calm moment and then lay out the consequences simply and clearly. Conversations like these are how you get your child to think about alternative solutions other than yelling at his sister, name-calling, or acting out. Look at it this way: we all get frustrated, we all get angry, and we all get anxious. But everyone has to learn to deal with those feelings appropriately. 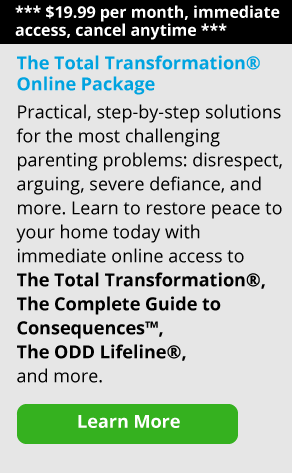 And a problem-solving conversation is the most effective way to talk with your child about change. Don’t accept every invitation to argue with your child. Understand that he wants you to get upset so he can drag you into a fight. Then go do something else. And remember, while you don’t want to get sucked into a power struggle, you also don’t want to destroy your child’s pride by demeaning him. You just want him to stop talking poorly to his sister. Many parents get frustrated and ground their kids for long periods of time in order to make the punishment stick. Personally, I think that’s a mistake. If you simply ground your child, you’re teaching him to do time. And he won’t learn anything new. But if you ground him until he accomplishes certain things, you can greatly increase the effectiveness of the consequence. I always say to make your consequences task-oriented, not time-oriented. So if your child loses his video game privileges for 24 hours, he should be doing something within that time frame that helps him improve his behavior. Simply grounding him from his video games for a week will just teach him how to wait until he can get them back—not how to behave more appropriately. Many parents believe the key to making consequences effective is to get a bigger hammer, but that’s not a sound teaching method. And it’s ineffective. Think about it, if you ground him for 30 days and then he does something wrong tomorrow, what are you going to do? Ground him for 40 days? It won’t be effective at that point. And you probably won’t stick to it anyway. You are basically out of grounding ammunition! But, if you ground him for 24 hours, then if he misbehaves again later in the week, you can ground him again. Again, we want consequences to be learning experiences. A consequence that doesn’t fit the crime will just seem meaningless to your child, and won’t get you the desired result. Remember, you don’t want to be so punitive that your child simply gives up. And you don’t want to use up all your consequences ammunition all at once. It’s ineffective and doesn’t translate to better behavior. And better behavior IS the goal. In other words, you’re trying to engage his self-interest. If your child is a teenager, he won’t care about how Dad feels. 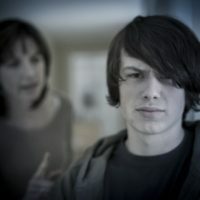 Adolescents are frequently very detached from the feelings of others, particularly their parents. They might feel guilty and say they’re sorry later, but you’ll see the behavior happen again. I always tell them, “It’s simple—you’ll know it’s working as long as he’s being held accountable.” Accountability gives you the best chance for change. Think again about the police officer who gives the speeding ticket. Does he actually believe that a single speeding ticket ensures that a driver never speeds again? Of course not. But, the officer knows that if he holds the speeder accountable every time that even the worst offenders eventually learn to slow down. In my opinion, there are certain things that should never be taken away from kids. For instance, you should never prohibit your child from going to the prom. Not ever. That’s a milestone in your child’s life. Personally, I think that milestones should not be taken away. Your child is not going to learn anything from that experience. He’s just going to be bitter. I also believe that sports should not be taken away. I have no problem with kids missing a practice if that’s part of a consequence, but taking away the sport entirely is not a good idea. When giving consequences to your child, be consistent and firm, but don’t show disgust or disdain. In my opinion, you should never be sarcastic with your child because it’s wounding. What you’re trying to do is raise someone who can function, not somebody who feels they’re a constant disappointment to you. It’s very important to shape your behavior so that your child knows you’re not taking his mistakes personally. Remember, the look on your face and the tone of your voice communicates a lot more to your child than your words do. Positive regard is critical for getting your message across. I think it’s important to remember that life is really a struggle for many kids. Going to school is difficult, both academically and socially, and there is tremendous pressure on children and teens to perform today. Personally, I think that kids should be recognized and respected for that. Think of it this way: what you’re really trying to do is work on your child’s behavior to get him to try to do different things. So if your child misbehaves and you ground him from everything indefinitely, you’re losing sight of all the other things he did right. And he will, too. We want our kids to learn, so we use the things they enjoy as leverage to teach them better behavior. After all, giving your child a consequence until he shows you he can do better is an effective tool you have at your disposal at all times—even if he tells you he doesn’t care.